Mark Duggan, a black Londoner, was killed by police in 2011. Police performed a "hard stop," meaning, they forced Mark’s car to the side of the road, and they were armed and ready to shoot. Within minutes, they shot Mark. Police first reported Mark’s death was the result of a shootout. Mark’s friends and family didn’t believe it. Two days later police admitted it wasn’t a "shootout" — that only police had fired their weapons. Rioting broke out in Tottenham, London, then spread north to other cities. By the time it had ended, five people had died in the rioting. The Hard Stop follows two of Mark’s friends from childhood, Marcus and Kurtis. Filmmaker George Amponsah spends a long time with them, maybe two years or so. Amponsah adds news and surveillance footage from the night of Mark’s death, from the riots, and also from the news reports of excessive force from the 1980s in the housing project where they grew up. The result is a documentary that feels like it follows the young men through their whole lives. We join Marcus and Kurtis sometime in 2012, before Marcus’ sentencing. Marcus has been accused of being "the" instigator of the riots that followed Mark’s death. There is footage showing him among the large, restless crowds that night. Marcus wears a radio-tracking ankle bracelet as he awaits his trail. He shares a flat with two friends, both of whom have recently been released from prison. Kurtis has children and wants to go straight. It’s hard and it doesn’t pay as well, but he sticks with it. A friend is introducing Kurtis to Islam, but Kurtis doesn’t want to lose things he loves — dogs, music... the imam tells him he won’t miss those things. Kurtis applies for jobs. At one point he gets an interview at a Tesco (a UK supermarket/drug store chain). He’s nervous, not sure it’s really what he wants, but sees the good in the stability it would bring to his family. He doesn’t get the job. It’s easy to root for Kurtis to succeed. At the same time, I wish he weren’t so impulsive — there’s a scene of him talking to the camera while driving on a four-lane road in the London suburbs; suddenly he sees another car challenging him for position. He races the other car, weaving in and out of traffic, creating a bit of uncomfortable tension for us while he laughs at the fun. 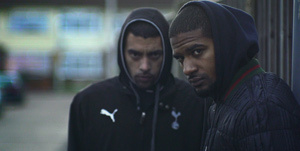 The filmmaker takes us back to Broadwater Farm housing project where Marcus, Kurtis, Mark, and their friends grew up. There were problems in the ’80s between residents and police. Even back then police were accused of using heavyhanded tactics. Back then, police were not punished for their use of excessive force. In 1985, there was rioting after two residents and one officer died during police operations at the project. It’s sobering to consider that for at least two generations, families like Marcus’ and Kurtis’ have grown up with this sort of policing as a fact of life. Someone observes that if only the bad cops had been suspended from their jobs back in the day, the community would have felt some sense of justice and resentment would have cooled down. Kurtis has a bad day when his dog is impounded and he has to go ask the police for his dog back. He is in no mood for an interaction with police officers. When he gets home he feeds his resentment by showing the camera misleading headlines from their past. A charge of possession becomes "teenager jailed for cocaine smuggling." Then he looks up the hateful comments posted about Mark on the comments section of news stories. The camera asks Marcus what it would take to admit the police were justified in shooting Mark. Marcus can’t even contemplate a scenario in which an unarmed man could be shot by police and have it be called "justified." Marcus will be sentenced in 2012. The inquest into the officers who killed Mark doesn’t even start until September 2013. It will try to determine whether Mark was armed — it seems to be almost certain that he wasn’t — and whether police officers are culpable for his death. One of the little cultural differences that the film inadvertently reveals is that the accused officer is only referred to as "V53" and not by name — a bit of protection that seems like an admission by the UK justice system of corruption or guilt. As Marcus’ sentencing day comes in September 2012, his solicitor tells him to expect to face 8 years in prison. His friends offer a preview of mundane life in prison, making sure he doesn’t forget flip flops for the nasty shower floors. The police verdict comes in January 2014. You can look it up if you want to know. Here, let’s just say it offers vindication but not justice. It’s one more step in the wrong direction for community/police relations. The Hard Stop can be a little rough around the edges. There are scenes that don’t necessarily add to the structure of the film, though most do add to the atmosphere. And I was surprised that The Hard Stop never even mentioned what it was that Mark was being pursued for — you can look that up as well. But I think Amponsah is right to stick with the perspective of Marcus and Kurtis, at least for this film. The result is a powerfully immersive documentary timed perfectly for Black Lives Matter. The Hard Stop may not have been the best film at TIFF. But it had the power to makes the conflicts in other films seem unimportant by comparison.